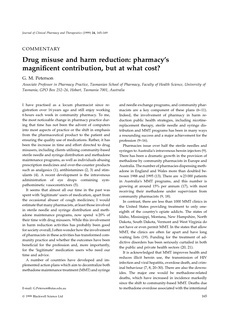 eCite - Drug misuse and harm reduction: pharmacy's magnificent contribution, but at what cost? Drug misuse and harm reduction: pharmacy's magnificent contribution, but at what cost? I have practised as a locum pharmacist since registration over 16 years ago and still enjoy working 6 hours each week in community pharmacy. To me, the most noticeable change in pharmacy practice during that time has not been the advent of computers into most aspects of practice or the shift in emphasis from the pharmaceutical product to the patient and ensuring the quality use of medications. Rather, it has been the increase in time and effort directed to drug misusers, including clients utilising community-based sterile needle and syringe distribution and methadone maintenance programs, as well as individuals abusing prescription medicines and over-the-counter products such as analgesics (1), antihistamines (2, 3) and stimulants (4). A recent development is the intravenous administration of eye drops containing sympathomimetic vasoconstrictors (5). It seems that almost all our time in the past was spent with ¡®legitimate¡¯ users of medication, apart from the occasional abuser of cough medicines; I would estimate that many pharmacists, at least those involved in sterile needle and syringe distribution and methadone maintenance programs, now spend ¡Ö20% of their time with drug misusers. While this involvement in harm reduction activities has probably been good for society overall, I often wonder how the involvement of pharmacists in these activities has transformed community practice and whether the outcomes have been beneficial for the profession and, more importantly, for the ¡®legitimate¡¯ medication users who need our time and advice.